Do you sing along with the radio and enjoy hearing great harmony? Has it been a while since you sang and you miss the joy it brought to your life? If you are looking for fun, friendship and the excitement of singing 4-part harmony, then High Desert Harmony Chorus is for you! Becoming a member....High Desert Harmony is always looking for women who enjoy singing and would like to express that love of music in a fun-loving group. The first step is to visit one of our rehearsals, and if this seems like the place for you -- come back again next week! 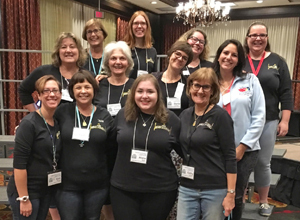 Membership in High Desert Harmony, and Sweet Adelines International, provides not only LOTS of singing, education and camaraderie, but also the opportunity to grow in leadership and community outreach roles. Depending on a member's interests and goals, educational opportunities can include musical arranging, judging, and director training. When you become a member of Sweet Adelines, you aren’t simply joining an organization; you become part of a sisterhood. New acquaintances will quickly become your biggest supporters and extended family, cheering you on in your musical journey and, even more, in life.